The majority of tables are custom-built and made to measure to the customer’s requirements. 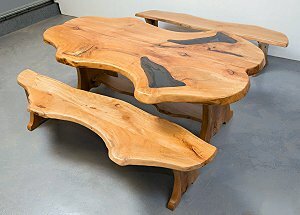 The most recent table was crafted in the form of a giant cello, plus benches to match. Pictured here. All of the products are designed for lifelong use. A steel chassis is now used for all products, which hastens manufacturing, enhances strength and permits parts to be easily replaced. Garden furniture is the latest expansion in the company’s product range, made from timber grown in Britain, which means that it’s well seasoned to the weather here. The steel used is forged by a local blacksmith, to provide an enduring backbone for the wood, which is treated with durable Osmo oil. Farmhouse Furniture has been producing beautiful solid wood furniture for more than 20 years, in the Black Isle of Scotland. They build to any required size, from local timber felled under license, or from storm damage. 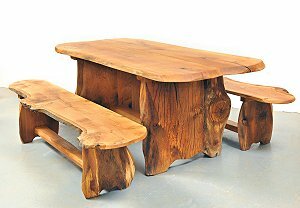 For further information and to view Farmhouse Furniture’s varied ranges of hand-made solid wood furniture, go to the website.